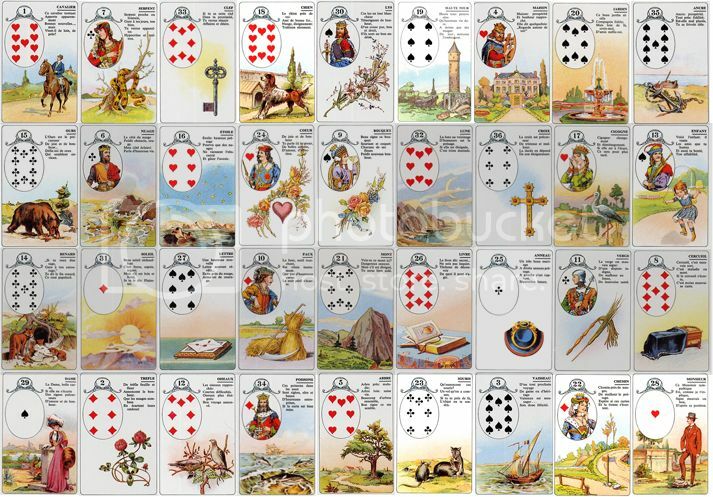 spreads, card combinations, the Grand Jeu and more! I am gratified and relieved to hear it! Please note that the spread was definitely saying the next move is now overdue. Now here's the thing, at this moment I am subjectively only able to read this in the context of a particular man. We do not know each other. I contacted him online yesterday for professional reasons. He is open to the contact and will read what I sent him. I have been planning this for the last several months. I find him very attractive, but aside from that I don't have any reason to think he would respond in any way other than professionally. I don't know what to do with the house in house of snake. I got this in another reading I did about him. Is this him living with a woman? Or is this about problems at home? Snake is in house of clover knighting to heart in child and letter in mountain and fox in tower. Do I need to assume I have a rival? Woman in house man – The woman takes the initiative in making contact, she approaches him. Clover house woman – Literally, the woman's got luck in her house regarding her initiative. Let's say for now that he responds positively. Clover knights to scythe in house of roads, and stars in house of birds. Luck is about an absolute certainty about a truly great communication and way two people relate to each other. This is confirmed by the next card in the line, birds in the house of lillies. A first phone call (or online exchange?) after her initiating contact has a quality of familiarity between them, of some kind of affinity, or harmony. Birds knights to mountain in letter, heart in child, clouds in whip and fox in tower. I'm stumped with mountain letter. But it seems the communication is promising with regard to love, and there is some uncertainty about there being tension or not, both parties are also being cautious. But what's obvious is that there's a great deal of depth: Fish in the house of sun. Knights to book in heart, lily in fox, stars in birds, and sun in garden. Tree in Moon: Something is happening between these two that is worthwhile on more than one front. Ship in Fish – is he actually in another country? Roads in Anchor: very nice, decisions for long term, keeping of word. Man in Cross: I still think he's been on a bit of a bummer lately. OK, Mr. L. Here's my reading of your love life . The GT is attached as word doc, I couldn't manage all that technology without photoshop. After looking at this a while yesterday, I am pretty sure the corners are giving the tact here. Tower-Storck – a mighty look-out for changes, and bouquet-sun, the reward for the changes. You did a really good job, and those chances paid off...! Indeed the four corners will somewhat expand on the situation too. Excellent. This man and woman are already in some kind of relationship. They are in a loop, connected diagonally by tree – the relationship has been in development for some time, has taken root. It is not going to end any time soon – I bring that up because I see functional problems, which I'll come to. They are also connected by mice-tree and rider-mountain, which set the general constellation of the relationship at this time: problems that have been there all along, and an impediment in moving forward, defining the relationship, giving it form, a name, and direction. I'll interject and say that it may be significant that they are in this loop, but not knighting to each other. Confirms to me that the relationship lacks definition and contour. I generally think of knighting as revealing hidden motivations or thoughts. If we aren't knighting each other, we might not always be thinking of each other. It's as if there are two worlds keeping us busy and we see each other in the middle. With respect to the relationship, it's hard to tell here who this might be. I know who I hope it is, and from reading the rest I get a feeling that this is my walking partner..! The Tree joining us is in the house of the Child which means it's a relatively new relationship (true), and that it seems fated (to me anyway), and it might be describing our current "helping each other out with health goals." So, health and budding relationship seem appropriate. Looking at the woman in house of ship, am getting the feeling that she is waiting for him to catch up with her in thought, get to the page she is on. She is not going anywhere at the moment, but she is aware of what is lacking and there is no guarantee that she will not move on at some point if things don't develop (knights to anchor-scythe). She is possibly foreign, her character has a sophisticated kind of openness and a positive outlook. She has a differentiated and discerning sensibility. She has made her mind up about the nebulousness and standstill in the relationship, and is so clear about where she stands on them that she doesn't need to reflect further on them. She is adept in public, absolutely reliable. She may be a kind of institution, a rock, for some other people. In this case, both. She was born in another country. She IS in a relationship with another man... she IS sophisticated and is open as well as positive. She is very discerning and she does make up her mind and is, as you described her: absolutely reliable. Full marks. What got my attention was your: "feeling that she is waiting for (me) to catch up with her in thought"
I've always had that sense of things, but in reverse... that she needed to catch-up with me... or at least live a bit more and then come to me. It's weird. I know. Heart is in house of woman. The feelings between them, or at least the emotional intentions between them is about nurturing, generosity, comfort, and caring reciprocally for the other's well-being. Good job. The right stuff is there. We do have feelings for each other. I know she likes me, and I definitely like her. We both care for each other, that's certain... and I do think we'd be a terrific match. At the very least, this is a friend I would keep in my life for as long as I can. ship in coffin: Something planned is on hold, a proper take-off lies stagnant. In fact, I would say it has not happened at all. Indeed, right. Key in house of paths – also knights to woman: A decision about the relationship really does need to be made. Imperative. At some point, she may make this a condition. Indeed, but the choice is somewhat moot with a gent in the way... and I'm too much of a gentleman to interfere while she is happy. Roads in book also knights to man. The man is the one not moving here. He is the one avoiding decision and movement.Indeed right, as explained above. Fish is in house of fish: Deep resonance in the relationship. Both parties find and cherish what they find in each other.Very true, if this is my walking partner. Clouds in house of moon: confirms that the the most essential things that have to be clear and defined, are obscured. Maybe nothing is clear.For now, yes. Fox in house of house: This could be a lot of things, possibly an unwanted mix of personal and professional. Perhaps as part of the indecision, one person is considering the details of their own circumstances more than is good for the relationship, or perhaps an excess of caution is used with regard to personal life not related to the relationship, which is having an influence on the relationship. Is one party being cautious, maybe closed off, when it would be more benficial to be open and trusting?More to do with her I think, meanwhile... I am too principled. However, I have faith that if she is the one... that fate will arrange things between us when the time is right. It's my resolution for the year. Besides, I don't know of anyone who wouldn't fight a prophecy just to prove it wrong, so I'm just letting this one play out. Ugh... the problems we fortune tellers have. We know it will happen, but we can't make them happen to suit us... so it has to play out. I'm looking at the man, it is interesting that he is kind of in the center, in the house of mice. He is troubled. It looks like he is swamped, buried in those issues up top his head. Can he resolve them. Ugh, yes... I feel tired all the time of late, and there is a lot of work and stuff running through my mind. Money, etc. But I think it'll clear up eventually. Book is in star: Is he obscuring his own wants and desires? Doesn't know what he wants? Doesn't understand what is holding him back?Indeed, right. I am purposely not being as free with my comments and feelings with her, though I am letting her know in many unsaid ways that I there for her. We do flirt, I do tell her she looks smashing... but it's all jibes mixed in with work etiquette seeing as we work together. Another reason for keeping things professional atm. Fish-fish: He is virtually given to the relationship, he feels the connection and the resonance (but the book is still in star!). Gosh, yes. Cross in house of birds: and birds are in house of clouds. I see birds in terms of language and words - this direct kind of communication. There are conversations that are extremely difficult for him. I am not sure if they really are so difficult, but subjectively, he experiences them that way. clover-clover paired with ship-coffin: the woman is completely optimistic and believes the stillstand will resolve in a positive and happy way. She has been thinking that way, something subtle is saying that she won't think that way forever. Most likely, yes, however I think I have more time... I think I'm playing a long game with this one, but she's worth the investment. And if it doesn't pan out.. well... I'm richer for having her in my life one way or another. Cross in birds paired with book in stars: Talking about it is very difficult, maybe stilted, because one person doesn't know what they want. Key in roads paired with child in heart: A decision really must be made, if this new love is to develop any further. Very likely... but I remain optimistic. Will go looking at the rest of what you wanted soon. THank you again for such a bang up job on this..! You did really really well!! I'm really glad that hit the nail the way it did - I didn't know I could do that . It's interesting, reading for someone else, it's like drawing in the dark. And if I look at a spread long enough, I get a sense of the dynamics. But what I really think is that the cards want to tell you is that she may not be getting what you think you are communicating non-verbally. Especially when things are determined by respecting boundaries set by workplace. So I think the task set out by the cards is for you to tell her what you are feeling. I think she is being held back by not being sure, and she can't be sure. The cards are saying: say it direct, stop signalling the safe way. Am looking forward to your thoughts on the connecting line! I also agree, I should tell her plainly how I feel... But now is not the time for such admissions. She's picking out valentine's day gifts for him and is in the new love phase of it. She'd never forgive me if I were to interfere or impose myself now, and with good reason. If it's meant to be, it'll happen. Besides, aren't the cards saying she's in love? Aren't they also saying that things will grow between her and I? Also, glad it's not who you thought it would be. Right, not who I thought it would be. But it could still be anyone, since he's not there yet. Could you feedback to the line between the man and woman card? Yes, haven't forgotten. Just busy with the kids and all. Saturday is going to be my Lenormand day, so you should have my comments by then and you're the first person on my list! Hi Maddy, you wanted me to look at the future line on this GT, so I'm thinking that the next exchange should probably be linked to reading futures... what do you think? Well, I think I'll be posting assignments soon. Anyways, continuing with what I had promised you. I didn't take into account your interpretation. I've forgotten it by now, and I wanted to be as unbiased about it as I normally would. Clover in the house of the Lady: a creative process that you're going through for (fox in Tower). Fox is about who you let in and who you discard, in the house of the Tower we have an agency of sorts doing the sifting between good and bad. Sooo... there's a hurdle you need overcome for the creative process you have in mind. Because of this 'hurdle', you're taking pen to paper in order to impress someone at the top (of the mountain). Birds in the house of the Lily: Discussions about merrit? Or perhaps discussions / texts / emails to another gentleman in power over something. Sun in the house of the Garden tells me that you're hoping for some good news from one of your contacts. Scythe in the house of the Path could mean a swift decision is made. Fish in the house of the Sun: If ever there was a sign of success, Fish in Sun seems like success. Letter again from house of the Mountain could be a reply from the head of something. Mountain in the house of the Mice would mean that problems are melting away and that important obstacles have been dealt with. Tree in the house of the Moon: Giving health issues a good thorough look. Scythe again, in the house of the Crossroads could mean a needle or operation, Book in the house of the Heart could be reinforcing blood stream (hidden heart, cannot be seen). Some labwork is what I think this is all about. Mice in the house of the Key: You all know I hate the key... it's about a mechanical process that requires YOU to do something for the outcome to be beneficial. So then, Mice, which is plagues of worry and nervous energy, theft... stealing a need to act? Does that make sense? Perhaps this signals the end of some problems you've been having... again the link with the Mountain in Mice (some troubles being widdled away) with Ring in its own house. Could this be a cure? Or perhaps something that was routinely required is no longer required in a permanent way? Ship in the house of the Fish: Could be travels. Are you planning a trip to some coastal areas? The fish always remind me of the mediterranean. Links to Book in the house of the Heart and Whip in the house of the Book. Book book book... Would you need to travel for your book? Would you just want to travel for the heck of it? Book in Heart could mean that you're hoping it's a romantic voyage? Whip in Book could mean, you're hoping to let your hair down and roll in the hay? Or... is it all business as in a book signing? Negotiating, maybe a deal? Crossroads in the house of the Anchor: Indecision about the path to follow? Ring in Ring again, and Coffin in the house of the Letter. Could Coffin in house of the the Letter be a prescription for some rest and relaxation? Ring in Ring probably underlines the need that this advice needs to be respected... whatever the advice is. Why would the snake matter here? House in Snake is all the way up on the 1st row, you both are on the last one... It's not even being knighted? So if this card is important. what importance do you tie to the House? Security and refuge, right? Snake gives that refuge a cooler more intellectual tinge in my opinion. It's got clean and tasteful rooms, artwork, etc... I imagine nice bobbles and trinkets, pieces of artwork, etc, but not a place for kids... it's too clinical and adult. Hiya, impossible to comment on the future! The health stuff - I had a health crisis involving lots of scary pharmaceuticals and 3 operations over 3 years. Fun, I tell you. But it's all over now, I'm fine. I do have to get blood work to check stuff every month or so. Never been a big deal and my levels are always nearly perfect. The book stuff - I skipped his agent, and got it the mansucript to him directly. Now waiting on pins and needles, and obviously I think he should have read it immediately, while he is a person who knows his schedule for the next months. But what I really want to know is what are the circumstances around me and Mr. Man in house of cross meeting? I see that line as a countdown to meeting. By the looks of things, you should plan a vacation shortly after the next blood test. Do we meet in the middle or do i have to go all the way across the board and he just stands there in his cross thing? When cards meet 'metaphorically' as the Tree in Moon... It's just something you two share, but who knows. There are two stages here, relationship reading and the reading of the future. The future is telling you what will transpire between now and when you do meet him. The relationship reading is about what unites you to each other (a common purpose? ), not necessarily a meeting place... Sure it could be hinting at palm trees under the moon... But let me know once you've actually met him! Hindsight, and all. If the two cards knighting to crossroads in anchor indicate that I'm being given advice to resolve the crossroads in anchor, then couldn't coffin in house mean "finish the novel" and ring-ring is telling me serious it is? I keep forgetting to answer this. I don't normally knight a card unless it's a person. Meanwhile, I only check diagonals on events... I use the two techniques under different circumstances so to speak... so I wouldn't have Knighted those cards you're asking about... also, there would be three cards knighting the path. Either way, you could, interpret it that way if you like, even if I wouldn't have.